“It’s the derby, which is so much more. In September I asked for a bit of magic and Phil Jagielka popped up with just that. Dare we ask for more? To win this one would be…phenomenal. 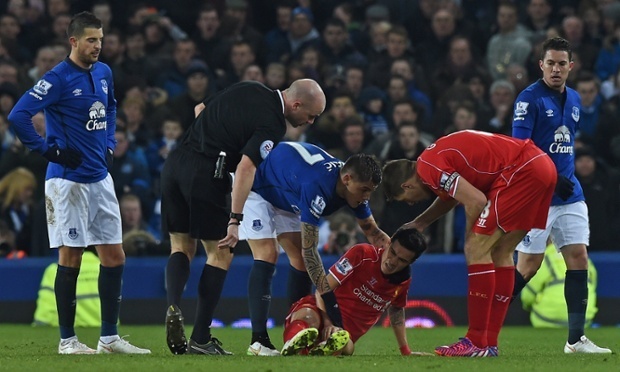 That’s how I concluded the preview for the Merseyside derby. Boy, was that the mother of all anti-climaxes. In fact, it was one great big ninety minute anti-climax. Liverpool, perhaps nervous that the Stevie Gee Grand Farewell Tribute Show would be ruined by those insolent upstarts from across the park. The man of the hour himself had to rely on some excellent Sky editing in the post-match analysis to come out smelling of roses because he was awful. Luckily for both him and Liverpool, Everton seemed even more arsed about losing. One shot on target in the match – in the 86th minute. Chances were few and far between and we couldn’t keep possession. We almost presented the perfect finale in the Stevie Gee Grand Farewell script but for Steven Naismith putting his head in the way. As a result, it was acceptable. A draw against the league’s form team is hardly shameful. The performance was though. Remember those derbies where we didn’t try? Where Rafa Benitez saw fit to call us a “small club”? This was a throwback. Sometimes it’s tough to shake the past. There were some good performances thrown in there: Joel was composed and dealt with everything that came his way. Although he almost committed a Krasnodar repeat when Sterling beat him to the ball, his save from Gerrard’s free kick looked so easy only because he had got his angles right and due to his sheer size. The idea that Tim Howard will instantly replace him in the starting line-up, as suggested by Roberto Martinez, is an insult to the Spaniard. Howard may be training well and could work his way back into the team, which is fair, but to throw out a keeper in form and replace him with someone who had hardly played well at all before sustaining an injury is ridiculous. Whatever happens, Joel has established himself as a serious contender for the No.1 position, which is what Evertonians have been craving. Coleman, Jagielka, Stones and Baines works as a back four. Oviedo less so. He was outfoxed at times by the dangerous Jordon Ibe, but contributed to the attack. John Stones, the defensive diamond of English football, was naturally brilliant. However, it works much better with the contribution of Phil Jagielka, his senior and Yorkshire contemporary. As a pair they acted as a Geoff Boycott backward defensive over the entirety of the ninety minutes. Stones and Jagielka have started eleven games together and Everton have lost none of them. Sometimes stats like that tell you all you need to know. How great is Muhamed Besic though? The Balkan battering ram took no prisoners on Saturday, which constitutes the ideal Merseyside derby performance for a midfielder, and with James McCarthy back the Everton midfield looked impenetrable for most of the game. The problem now is in front of that, if we excuse Gareth Barry for looking as mobile as a fridge on this occasion. Steven Naismith took some major blows for the cause but on the most part was flicking the ball on for no-one. Kevin Mirallas only had a fleeting impact on proceedings, and Romelu Lukaku was anonymous for the vast majority of the game. Having to play on the wing for long periods was not useful but for a purported strongman Lukaku was unable to beat any of Can, Sakho or Skrtel in a physical battle. 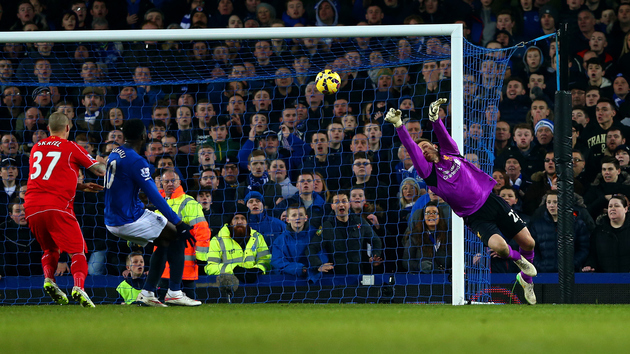 When there was a chance to get at the Liverpool defence Lukaku was nowhere to be seen. In fact, he didn’t register a single memorable effort. I’m not one to write Lukaku off, especially as he is just 21 years old and was given a lengthy contract. I won’t even throw his price tag in his face – if players had to live up to price tags, the likes of Tim Cahill, Phil Jagielka et al could’ve given up after a season. It’s all relative. The bottom line is that we need someone to lead the line and inspire success, and it seems that Lukaku can’t handle it. Unless Arouna Kone is willing to take up the mantle, we may have a serious problem there if Lukaku doesn’t turn this around. Onto the next fixture then. Oh, it’s only the runaway league leaders away from home then. It’s sound. The next step in our Tour de Twats, the round of colossal knobheads we have to face up against (Crystal Palace excluded) we’ve got this lot. When the transition between the skinheads ambushing away fans on the way to Stamford Bridge and the ‘new wave’ of floppy-haired super-plastics happened, I don’t know. Now there’s just a great big group of people trying to shout loudest that they’re a Chelsea super-fan, because they remember when Gianfranco Zola played and that. Poor them, struggling through a brief period of Mario Stanic. Fair play to them in any case because they’re watching the strongest team in the league right now. Chelsea are excelling on a heady mix of outstanding talent, tactical nous and pure snide, which at the moment looks like they’ll canter to the title. From an Everton point of view this is a truly daunting task. Not since Paul Rideout notched the winning goal in 1994 have we achieved a victory over Chelsea at Stamford Bridge, and apart from a run of successive draws under David Moyes we haven’t come all that close. In goal will be the monumental beak of Thibaut Courtois, with Ivanovic, Terry, Cahill and Felipe Luis at the back. Matic and Fabregas will act as enforcers while Hazard, Willian and Oscar ply their dark trade in front. Likely to be Loic Remy up front. In reserve all they’ve got are Didier Drogba, Cesar Azpilicueta, Ramires and Juan Cuadrado. They’re screwed really. So do we actually have a prayer here? It would be fair to assume that a side that have only ever lost one league game at home under their current boss will have this nailed on. Then again, Basel and Bradford join Sunderland in the list of Stamford Bridge conquerors. In the win against Aston Villa and draw versus Manchester City they were far from their best. Diego Costa, who tore us apart at Goodison Park, is still suspended. His deputies, Remy and Drogba, have hardly impressed. Plus the pressure of maintaining their league lead in front of their own fans will see Chelsea forced to throw plenty into the attack. They can be caught out, as Bradford showed. But in the likes of Fabregas and Hazard they have not just the best players in the league, but up there with the best in the world. But can they do it against Muhamed Besic on a cold Wednesday night? Seeing as there are eleven days between this and our next game, at home to Leicester, we should not need to rest players who are a minor doubt or who have a slight fear of injury. So could we see Coleman, Jagielka, Stones and Baines at the back? Hopefully. Howard between the sticks, most likely. Now for the Everton Dream XI to continue. McCarthy, Besic, Lennon, Barkley, Mirallas, Lukaku. The real one? McCarthy, Barry, Mirallas, Barkley, Naismith, Lukaku. That’s how it is, folks. There’s really very little to lose here. So we may as well take this lot and remind them what Everton can do. And remind ourselves while we’re at it. Let’s get at ’em Everton.